Explore light color mixing through hands-on activities with Romy Randev of Looma and Helix educators. After exploring color and light, visitors will be invited to create their own Looma lamp. Using a cardboard template and LEDs visitors can make their own light box capable of creating hundreds of colors. Workshop materials fee $25. Register in person or email helixlosaltos@exploratorium.edu. All payments should be made in person on the day of the workshop. 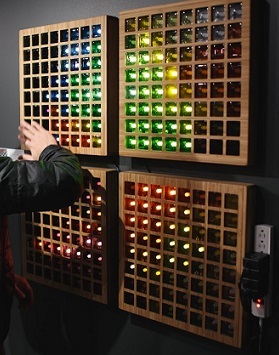 Penumbra is an interactive installation that responds to movement in its environment. Without any human interaction, Penumbra is disguised as a decorative glass wall. However, each colored glass tile illuminates individually as sensors that respond to movements control LEDs behind the glass.